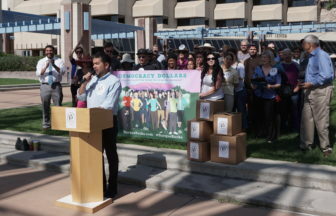 Eric Griego speaking about presenting Democracy Dollar petitions to the city clerk, at an August 2018 press conference in Albuquerque Civic Plaza. If commissioners refuse, the city may be on the hook for a special election. The question at issue is whether a special city election will be triggered if the county commission does not allow voters to vote on the petition this November. NM In Depth has asked the city attorney, but has yet to receive a reply. Article six of the city charter addresses how amendments to the charter can be made. One method is a petition drive like the Democracy Dollars initiative. Once the proper steps for such petition drives are followed, the city is required to hold an election within 90 days. Special elections cost the city anywhere from $400,000 to $600,000. There are two places in the charter dealing with citizen petitions. Article three of the charter, dealing with “direct legislation by voter initiative,” calls for such elections to be held during regularly scheduled elections. While the petition forms given to the Democracy Dollar petitioners by the city clerk are labeled at the top “Direct Legislation by Voter Initiative,” the Letter of Intent delivered to the city clerk clearly stated the initiative is to amend the charter, which is dealt with in Article six. Albuquerque manages it’s own elections, in odd-number years. Bernalillo County manages county elections, which are conducted in tandem with state elections in even numbered years. In order for an Albuquerque city-specific ballot item to be on a County election ballot, county commissioners must agree. Back in 2016, commissioners refused to put two city ballot items on the county ballot, one was a charter amendment at the request of the city council and the other was for direct legislation through a voter petition drive. The city council charter amendment proposal was ultimately never acted on through a special election. The ballot initiative for legislation ended up on the 2017 city ballot. In the current case, the county commission is being asked for room on the ballot for a charter amendment proposed by voters rather than the city council. Javier Benavidez, who managed the Democracy Dollar petition drive this summer, said the city clerk certified last Friday the group had turned in the required 19,480 signatures for placing the proposal before voters. In an emailed statement yesterday, Benavidez and other leaders of the petition drive said they were led to believe by commissioners and their staff that last Tuesday’s vote was “simply an administrative process” to put the measure on the ballot. Instead, they heard commissioners debate the merits of the public financing measure before three of five voted against it. Benavidez in an interview said that was inappropriate. The details of the Democracy Dollar program would be created by the city council after the fact, he said, should voters endorse the idea through an election. “We went by the book, adhered to the process, worked hard throughout the summer, hundreds of people spent thousands of hours in the hot sun, only to be undercut by the county commission at what was supposed to be an administrative process,” he said. The emailed statement, which was sent by former State Senator Dede Feldman, and including email addresses for Benavidez, Heather Ferguson, Viki Harrison, and Shannon Kunkel of Common Cause, and Eric Griego of New Mexico Working Families, said they would have encouraged the voters who signed the petitions to attend the meeting to give commissioners input had they known the county commissioners would debate the merits of the proposal. They’re calling on commissioners to meet again next Tuesday so that can happen. Albuquerque’s city attorney said last night while he doesn’t have a firm answer about when the city would hold an election on a successful ballot initiative, city charter language stipulates that an election is required. “At some point this matter will have to be heard,” said Esteban Aguilar, Albuquerque city attorney, at a special meeting called by the Bernalillo County Commission to reconsider its decision last week not to place a public financing ballot initiative referred to as “democracy dollars” on the November ballot.